A common assumption running through many discussions about Appalachia since the 2016 election has been that the region is important to Donald Trump’s political success. Even President Trump seems to have internalized this line of thinking; of the 56 rallies Trump has hosted while in office, 12 have been in Appalachian counties. But the truth of the matter is a bit more complicated. While Appalachian voters in Ohio and Pennsylvania arguably helped Trump flip those crucial states, the media’s focus on West Virginia underlines how much the discourse about Appalachia is unanchored from reality. National discussions of Appalachian politics lack important context, and media outlets both inside the region and out can’t seem to remember past the last election cycle. The Hillbilly Politics series aims to change that. Looking at Appalachian politics on a state-by-state basis, it will provide the history and context needed to understand Appalachia on its own terms. For the series’ first installment, we’ll examine the state where Appalachia has arguably had the most influence on national politics: Ohio. If any part of Appalachia can claim national political importance, it’s Appalachian Ohio. Despite comprising no more than a fifth of Ohio’s population, the region has long held a disproportionate place in the state’s politics. Since 1962, Ohio’s governor has hailed from Appalachia over a third of the time, and the Speaker of the Ohio House has been Appalachian for over half that time. 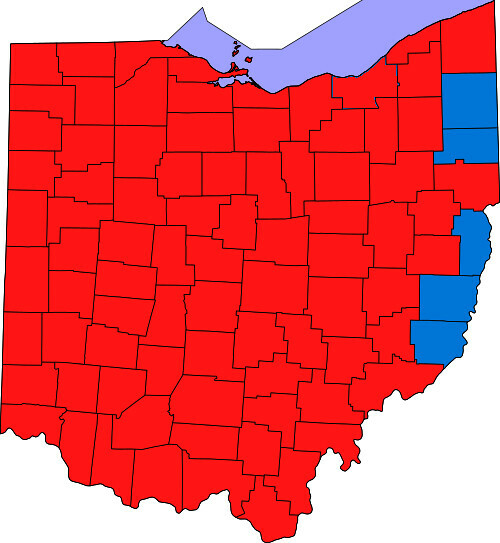 In national politics, Appalachian Ohio has played a major role in determining who received Ohio’s crucial electoral votes in several presidential elections, and the region’s increasing identification with the Republican Party may be making America’s favorite swing state firmly red territory. To understand Appalachian Ohio’s outsized importance, one has to look at its long history as a swing region in what has otherwise been a mostly stable swing state. From the New Deal until the last decade or so, Ohio politics was a stable game with a known cast of regional players. In the northeast was the Democratic juggernaut of Greater Cleveland. Diametrically opposed in the southwest stood the Republican stronghold of Cincinnati. In the northwest was the smaller but more Democratic Toledo, and in the west the even smaller and still more Republican farm country. Smack dab in the center sat Republican Columbus, which helped Cincinnati match Cleveland’s massive demographic advantage. Overall, these areas’ stable political preferences canceled out one another. Finally, in the southeast and east lay Appalachia. 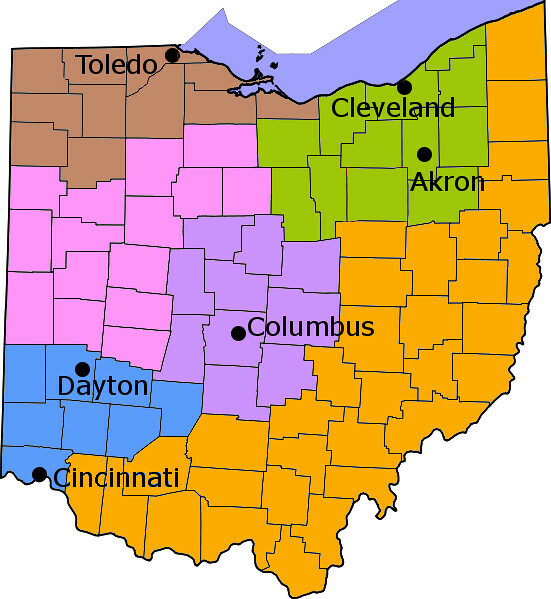 Map of Ohio counties with the state’s six regions highlighted. Ohio’s 33 Appalachian counties are highlighted in orange. Via Wikimedia Commons. Take a look at these maps of how Ohio’s counties voted in five presidential elections from 1968 to 2000. The first is 1968, when Richard Nixon won the state 45-43-12 percent in a three-way contest with Democrat Hubert Humphrey and segregationist George Wallace. The second is 1976, when Jimmy Carter beat Gerald Ford in Ohio by a mere 12,000 votes. The third is 1984, when Ronald Reagan pummelled Walter Mondale 59-40. The fourth is 1992, when Clinton won 48-38-21 in a three-way contest with George H.W. Bush and Ross Perot. The fifth is 2000, when George W. Bush beat Al Gore 50-46. Notice anything special about Ohio’s southeastern counties? Maps of five presidential elections in Ohio. Republican counties in red. Democratic counties in blue. From top left to bottom right: 1968, 1976, 1984, 1992, 2000. Via Wikimedia Commons. Like a blinking light, large sections of southeast Ohio seemed to switch party allegiances from one election to the next. 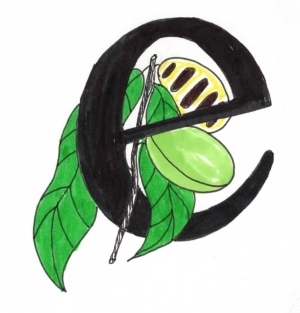 Rather than dramatic changes in Appalachians’ political preferences, these switches illustrate Appalachia’s position at the center of Ohio politics, a fact that made the region highly competitive for both parties. Of all the votes cast for president in southeast Ohio from 1976 to 2012, 47.62 percent were for a Democrat and 47.04 percent were for a Republican, a margin of about half a percentage point. With the exception of Northwest Ohio’s two percentage point difference, every other region in Ohio had vote margins of 10 percentage points or more during the same period. In close contests like 1976, when Carter won Ohio by only 12,000 votes, or 2004, when Bush won the state by 118,000 votes out of 5.6 million, southeast Ohio’s swing was seen by many as key in determining who won the presidency. But southeast Ohio’s swing isn’t Appalachia’s whole story. Looking at a late-20th century Ohio electoral map, one could be just as struck by the unfailingly bright blue band of Appalachian counties on the state’s eastern border. Map of Ohio with the five Democratic Rust Belt counties in blue. From the top down, they are Trumbull, Mahoning, Jefferson, Belmont, and Monroe counties. Via Wikimedia Commons. This is the core of Ohio’s mythical Rust Belt. Historically dependent on the steel industry and highly unionized, this region formed a bedrock of the Ohio Democratic Party for much of the 20th century. Only six Ohio counties voted Democratic in every presidential election from 1976 to 2008. One was Cuyahoga County (Cleveland). The other five were the Rust Belt counties of Trumbull, Mahoning (Youngstown), Jefferson, Belmont, and Monroe. Here’s the place making Democrats lose sleep. Following a decline in the region’s unionized steel industry and a national political realignment on social issues, Democrats slowly but surely lost ground in the Rust Belt. Although this trend has been going on for decades, it reached a critical point under Obama, when three of the Rust Belt counties flipped Republican in 2012. Little remarked upon at the time, the trend came to national attention in 2016 when four of the five Rust Belt counties went red and Mahoning County, home to the traditionally Democratic stronghold of Youngstown, barely went for Hillary Clinton. Despite a parallel shift toward Democrats in traditionally Republican Cincinnati and Columbus, Democratic gains in urban areas were unable to replace their Appalachian losses, with Trump beating Clinton 52-48 percent in 2016. Maps of the 2012 and 2016 presidential elections in Ohio. In 2012, three Rust Belt counties flipped from Democrat to Republican. In 2016, all but Mahoning County voted for Donald Trump. Via Wikimedia Commons. This pattern was largely repeated in the 2018 Ohio governor and senate races. Given that the received wisdom in the Ohio Democratic Party for winning statewide has been to run up the score in Cleveland, Toledo, and the Rust Belt, one can see why some pundits have pronounced the end of Ohio’s hallowed swing status. To get a feel for how all this played out on the ground, I spoke with Bill Shubat, the 25-year Democratic Director of the Board of Elections in Belmont County, a Rust Belt county on the Ohio River. Bill’s a lifelong Democrat, having worked in the Ohio Secretary of State’s office when Sherrod Brown held the position from 1983 to 1991. As Bill sees it, the Democratic Party’s troubles in Appalachia are more the result of the national party’s shifting stances than any changes in the region. Whether or not Appalachia is forever lost to Ohio Democrats remains a hotly debated question. Indeed, Sherrod Brown’s growing presidential ambitions are largely predicated on the claim that he can bring Appalachian voters in Ohio and Pennsylvania back into the Democratic fold. Whatever their preferences on the matter, Appalachians everywhere would do well to remember Ohio’s lesson: their importance comes from their place at the center of American politics. As partisan realignment and polarization intensify, the region’s continued importance rests with its ability to straddle the national divide and make sure no one can ignore the swing state of Appalachia.